Hammer Premium 3 Ball Roller is a high performance bag. It has a heavy duty wide and stabilized molded base. This roller includes a lot of extra space for your accessories. It also includes a detachable pouch. This bag can hold a pair of shoes of up to a size 15. If you are looking for a bag that is durable and stable, this bag is for you! This is the best bowling ball carrier I've ever owned. Lots of room for any and all accesories. Solid workmanship with professional grade materials. 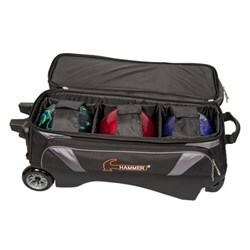 Other bowlers regualrly comment about the design and flashy looks, along with the practical storage and easy mobility. I strongly recomend this bag. The only positive about this bag is it has a lot of pockets. The strap and buckle have broken after just one year of use. How can you design a bag to hold back 48 pounds of round spheres and except it to not break. The expandable handle gets weak to where it feels like it's ready to fall apart in your hand. By Scar from Rochester, Ny. Thank god for the warranty. Bought this bag since I am an avid hammer customer and looked like the best bag going. 6 month in the plastic strap broke. 11 month in and now the plastic handle/feet have cracked in half. Just glad there is a warranty. The other hammer bag looks better with how balls are restrained in bag but guess the pick up handle/foot stands are same as this one. Also the material piping on outside started fraying by the 2nd month. The bag material has started to fray. The ball retaining strap is broke (really small and cheap material). Need something more sturdy to hold back 48 pounds. Retractable handle has to be tightened constantly. Would never recommend this bag until improvements were made. By tod from fair oaks, ca. ball strap clip too lightweight and breaks. Interior ball strap clip broke twice. Handle broke slowly over 2 months, and took over a month to get Ebonite to replace bag. Thank god for the 5 yr. warranty. Save Your Money $$, Not this one. I researched many bags before I bought this Hammer bag. This bag was a huge disappointment. The plastic bottom piece is cheap and will be destroyed before season end leaving your bag to constantly fall over. .Make sure you have a wall nearby! The material tubing around the bag has all frayed making the bag looking like it needs a shave. The good part is the zippers are sturdy. Why manufacturers make the base of these bags cheap is beyond me. i bowl 3 times a week and needed a new bag to hold three balls, bought the bag and used it for approximately 2 months before the strap in the bag to hold the balls down broke, the stitching is fraying at most of the seams, the handle on the bottom of the bag broke. just seems like a poorly made product and would not recommend to anyone looking for a durable bag. lots of room , great look-- wife will love it,she takes everything to the alleys and this has the room for it. This three ball bag is a tough and well thought out carrier. It has areas on the bottom and top of the product to grip it when picking it out of the trunk. The inner strap is very tough and the wheels are first rate. it also has room for all the supplies I bring to the lanes with room to spare. 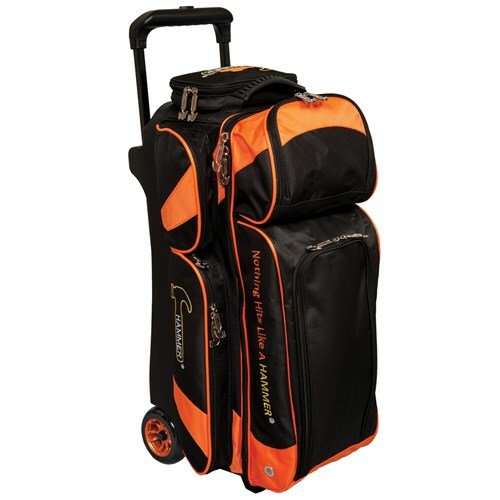 This is an excellent equipment bag by Hammer. The nylon is durable. Stitching is heavy duty. The look of the bag is eye catching. I get questions about the bag jut about every time I go to the lanes. 5 inch wheels are smooth and stable. 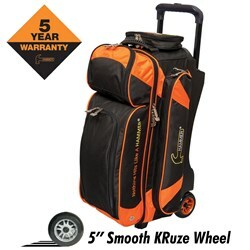 Bag has a nylon snap cord that straps the balls down in the bag for superb securing of equipment. The product description says up to size 15 shoe for the shoe pouch. That's a SERIOUS underestimation!! I where a size 14 and have room for my wife's shoes with mine in the pouch too!! At least a size 18-20 easily could fit in the shoe compartment. Great bag,a bit pricey, worth the investment of properly protecting your equipment. Hello Mac! In addition to the space for the balls, this bag has one, large shoe pocket and five accessory pockets. As of November 13th, 2018 this bag is priced at $179.95. Due to the time it takes to produce the Hammer Premium 3 Ball Roller ball it will ship in immediately. We cannot ship this ball outside the United States.